Courtesy of Nueva Sociedad. All rights reserved. This article is product of the alliance betweeen Nueva Sociedad and Democracia Abierta. To read the original content in Spanish, click here. We are at the onset of a long election campaign. Unlike all elections since 2006, this time Morales's triumph is not assured and his re-election bid is being questioned on the grounds that his candidacy distorts a constitutional provision. However, economic stability, his symbolic standing and the lack of any sound alternative project from the opposition leave the field quite open for the October 2019 elections. Now, for the first time, the Bolivian president's victory is not assured. 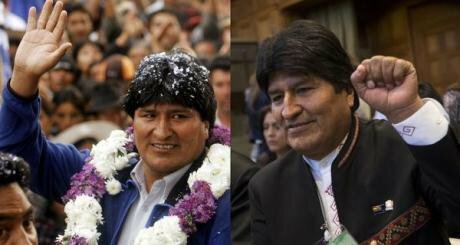 So, 13 years and one day after his arrival at the Palacio Quemado, Evo Morales fine tuned his cabinet with an eye on these elections which will be held in a very different context from that of all the other electoral consultations of the decade-long "process of change". Now, for the first time, the Bolivian president's victory is not assured, and his candidacy has first to be "enabled" by the Plurinational Constitutional Court which, in order to do so, must overrule a constitutional clause and contradict the result of a February 2016 referendum. During the vote, the "No" to a constitutional reform allowing indefinite reelection won by a narrow margin. On January 22, which is the Plurinational State anniversary competing today in Bolivia with Independence Day, Morales delivered his annual report to the nation. During the speech he recalled the achievements of the past 13 years and endeavoured to project some visions of the future at a time when the government's support is eroding, especially among the urban sectors. 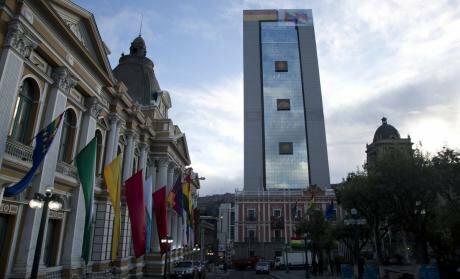 The cabinet reshuffle was aimed at strengthening the areas which the Bolivian president considers key for his reelection. So, Luis Arce Catacora, the former Minister of Economy who is widely considered to be the architect of the Bolivian "miracle", is back in the cabinet. This minister, who guaranteed more than a decade of economic growth and stability, took office with Morales in January 2006 but had to resign in 2017 due to health problems. His return now reinforces the image of "stability" which was the banner under which the Movement to Socialism (MAS) campaigned at the 2014 elections, when Morales was re-elected with more than 60% of the votes and a 35-point lead over his closest contender. In his shortest address to Congress to date (50 minutes instead of the usual three or four hours), Morales highlighted the fact that Bolivia's GDP has grown 327% during his mandates to reach 44.885 billion dollars in 2018, and that the "financial cushion" - which includes international reserves, deposits and contributions to pension funds - has risen to 53.269 million dollars. He compared these figures with the 2005 ones, when "GDP was 9.574 million dollars and the 'financial cushion' only 7.600 million". Another figure who is back in the cabinet is Juan Ramón Quintana, a former military officer and sociologist who has a reputation for being "tough" and who will again be in charge of the Ministry of the Presidency, which means that he will in practice lead the cabinet. Former congressman and former deputy minister Manuel Canelas is the newly appointed Communication Minister, whose mission is to recover the middle classes which have been drifting apart from the process of change. Canelas was the first openly gay member of Congress, he lived in Spain for a number of years and remains close to the Podemos leadership. He will now be in charge of renewing a discourse that no longer galvanizes. Another strategic move to stall the government's erosion is the appointment of a major political figure to head the Ministry of Health: former president of the Senate Gabriela Montaño, a Santa Cruz doctor who once presided over the Executive Branch on an interim basis and whose task will be to lead a revolution in healthcare, one of the areas in which Evo Morales' government has shown less management capacity and which has motivated a considerable degree of questioning in recent years. Linked to Montaño's appointment, a universal health insurance has been launched and a multi-billion dollar agreement with Russia has been announced for the building of primary care centers and several high-tech hospitals specializing in oncology, cardiology, gastroenterology, neurology and nephrology. In short, the idea behind the reshuffle is more communication, more politics and more management to get in shape to face former president Carlos Mesa, who is the best-positioned opposition leader in the polls. Like Emmanuel Macron in France, Mesa is trying to build a "citizen platform" which while including old political figures, should use a new-sounding discourse and avoid being seen as a coalition "of the past" - which is precisely how the MAS pictures him: a former vice president under Sánchez de Lozada who reached the Palacio Quemado after the "Gas War" of 2003. Clearly, though, unlike Macron, Mesa is neither young nor new and seems to be lacking a true will to power. He nevertheless expresses the feeling of the sectors that question the "unconstitutional" candidacy of Morales and he keeps to a politically moderate discourse. But he will need the support of the radical right which is now thrilled with Jair Bolsonaro's victory in Brazil. The government's strategy is to polarize the elections generationally - between "the old" and "the young" - through some symbolic appointments, such as that of Canelas (37 years) and, especially, the election of Adriana Salvatierra as president of the Senate and therefore the third authority in Bolivia. The 29-year-old senator represents the "new generation" within the MAS and belongs to a "Guevarista" group called the South Column. However, the official revolutionary gestures coexist with strong doses of pragmatism. Morales addressed Bolsonaro as "brother president" in a congratulatory tweet after the victory of the right-wing candidate. This was followed by the handing over to Italy, without any prior process, of Cesare Battisti, a former member of the old Armed Proletarians for Communism (PAC) group, which was active during the Italian "lead years". He had been sentenced in absentia to life imprisonment. Battisti, who had been living for nearly the last fourty years in Mexico, France and Brazil, was handed over in less than 24 hours to Minister Matteo Salvini, who received him dressed in police gear and declared that "this Communist murderer" was going to "rot in prison". Morales is seeking to look close to Nicolás Maduro and to be, at the same time, in good terms with leaders of opposite ideological signs in the region such as Jair Bolsonaro. Morales justified the handover by pointing out that Battisti had illegally entered the country as he escaped from Brazil, where Bolsonaro had promised to deliver "this bandit friend of Lula's" to Salvini. "Do you feel that Bolsonaro is your brother?" a journalist from El Deber asked the Bolivian president. "Those of us who were born from this land are brothers because we were born from the same South American land. We are the children of Latin America, regardless of the ideological and programmatic differences: we are brothers", he answered. While the position regarding the United States is that of a distant anti-imperialism, Brazil is a regional power at Bolivia's border that carries much economic and political weight. And today Morales is seeking to look close to Nicolás Maduro and to be, at the same time, in good terms with the leaders of an opposite ideological sign in the region. A routinization of the revolutionary gestures, including the usual clenched fist, should also to be noted - it has become now something rather more ceremonial. The process of change in Bolivia was, from the very beginning, moderate and pragmatic. Despite the government's Socialist-like discourse and the opposition's claim that the country was on the verge of being "venezuelized", the fact is that under Morales the markets have flourished, consumption of the popular sectors and the middle-classes has boomed, financial services have developed, and the chic cafés and restaurants coexist with a renovated automotive park in large cities such as La Paz and Santa Cruz. 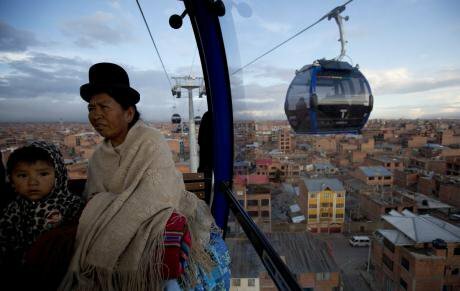 And the urban transport cable car, the largest in the world, which has not only transformed the landscape of La Paz but reconnected the different parts of the city, is having medium and long-term effects on urban sociology. The symbiosis between the modernizing will and the invocation of the indigenous ancestry which characterizes the government is best pictured in the inauguration last August of the Casa Grande del Pueblo which is to replace the neighboring Palacio Quemado, until then the seat of the Presidency and, according to Evo Morales, an emblem of the "colonial republic". The defeat in 2016 is now forcing the government to nolonger speak on behalf of the majority of the people, as national-popular movements do, but of the real people - that is, the social sectors mobilized in favor of continuity. This new 28-story building, an expression of architectural brutalism mitigated by Neo-Andean inlays, has caused much controversy insofar as it alters the urban harmony of Plaza Murillo and seems to embody a certain political megalomania. To counteract these criticisms, the government opened the new building to the masses, attracting a multitude of newlyweds and other visitors to its terrace, with the majestic backdrop of the eternal snows of the mountains surrounding La Paz. But the Casa Grande del Pueblo is a kind of Coliseum of the process of change: the materialization of an idea of permanence whose matrix is plebiscitary that clashes with the principles of republican democracy. The problem is that its defeat in 2016 is now forcing the government to nolonger speak on behalf of the majority of the people, as national-popular movements do, but of the real people - that is, the social sectors mobilized in favor of continuity ("We came here to stay for 500 years"). The Morales government was undoubtedly exceptional in many respects until 2014. From that moment on, the will to remain - and the consolidation of Morales as the irreplaceable leader - has been eroding the transformative agenda, weakening urban support and forcing the Executive to disregard some clauses of the very same Constitution which was approved during the "process of change". Part of that agenda of change is what the government endeavours to get back to now, in a hurry, as it heads for the elections. 2019 will be the first year since 2006 in which the political field in Bolivia is quite open: the government and the opposition will be actually fighting for the flag of change. Meanwhile, the opposition, with no alternative project for the country beyond some republican claims, is seeking to capitalize on the government's erosion. And centrist Mesa will have to face the radicalization - including more open racist expressions, especially in social media - of a sector in the opposition which has adopted some elements of the "anti-Communist" Alt-Right discourse and is enthusiastic about the new regional climate ushered in by Bolsonaro. But he will also have to face he lack ethnic and gender diversity among the top leaders of his platform under construction.